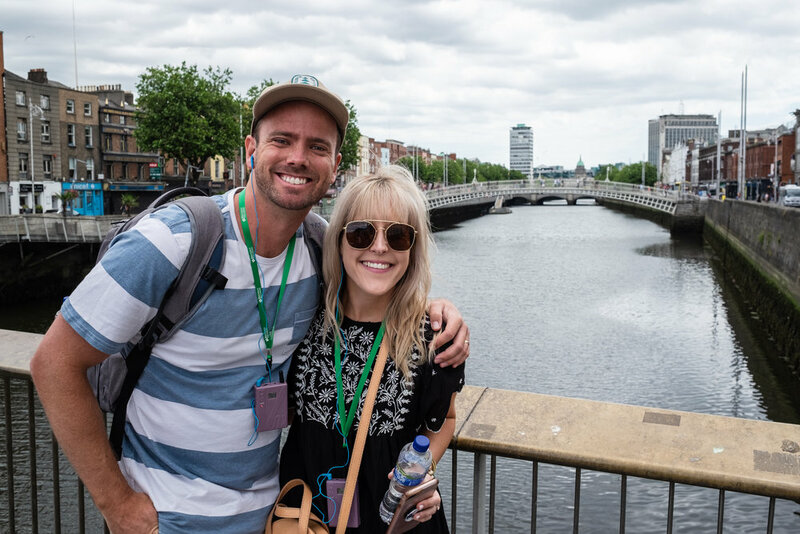 We’ve had SO many questions about our trip to Ireland with Adventures By Disney. Questions about how the tour works, what you do, where you go, how you get there, what’s the food like, does Mickey Mouse make a surprise appearance… you get the picture. 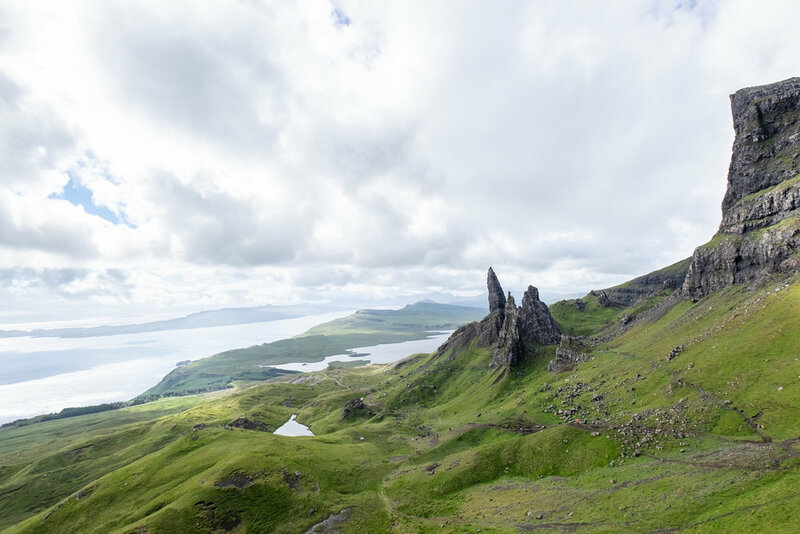 We figure what would be most helpful is to give you a clear snapshot of our Ireland Itinerary, day by day. Be forewarned: this blog is long. There’s just too much to share!! So grab an Irish coffee, turn on some celtic tunes, and let’s get started! We arrived at the Dublin airport to an Adventures By Disney representative, holding a bright sign with our names in bold (not sure why we are always so thrilled by that, but something about it makes us feel important). We were instantly whisked away to our hotel, The Westin, located right in the center of town. It was beautiful. Out of the corner of our eyes we saw two jolly looking men, sitting at a colorful table filled with props, toys, and gadgets. Judging by the smiles on their faces and the disney pins on their shirts, we knew they're our guides. Meet Stephen, an Irish local, who’s had a lengthy career of giving luxury tours of the Emerald Isle. He’s smart, witty, obsessed with Irish culture, and is a walking, breathing, wealth of information (If you ever meet him, have Stephen tell you about the fairies in Ireland. Fascinating stuff.). Then there’s Landon. He’s a veteran Adventures By Disney Guide who has guided groups all over the world. He’s kind, goofy, and knows your needs before you do. Hungry? Thirsty? Tired? Cold? Hot? Landon to the rescue! It only took about 20 seconds of chatting with Stephen and Landon to know that we were going to be instant BFF’s… and that this trip was going to be unlike anything we’d ever done before! That afternoon we toured around Dublin on our own. We grabbed pints of Guinness at The Temple Bar, we danced to live music, and “oo-ed and aww-ed" at the colorful flowers lining every street. It really is an incredible city! Before we knew it, it was time to meet our Adventures By Disney group for dinner back at our hotel. We were both a little anxious/excited to see who we’d be spending the next seven days with! 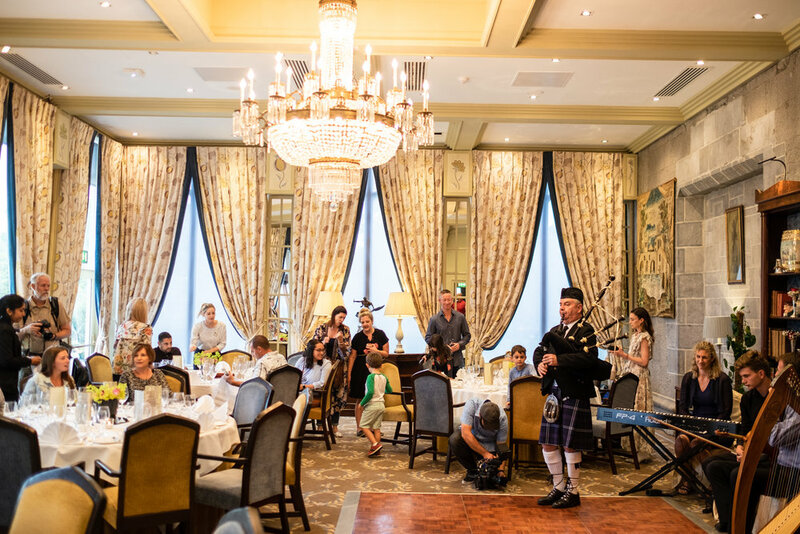 Not only did they have a feast prepared for us, the room was sparkling with elegant decor, and a harpist serenaded us with traditional Irish tunes! We made fast friends with the other families and couples, and talked for hours about our lives, what we do, what we were excited to see/learn, and how amazing this experience already was. And it had only just begun! Day two started with a breakfast buffet feast our hotel (still dreaming about their croissants!) and an early call time to begin our day of sight-seeing. 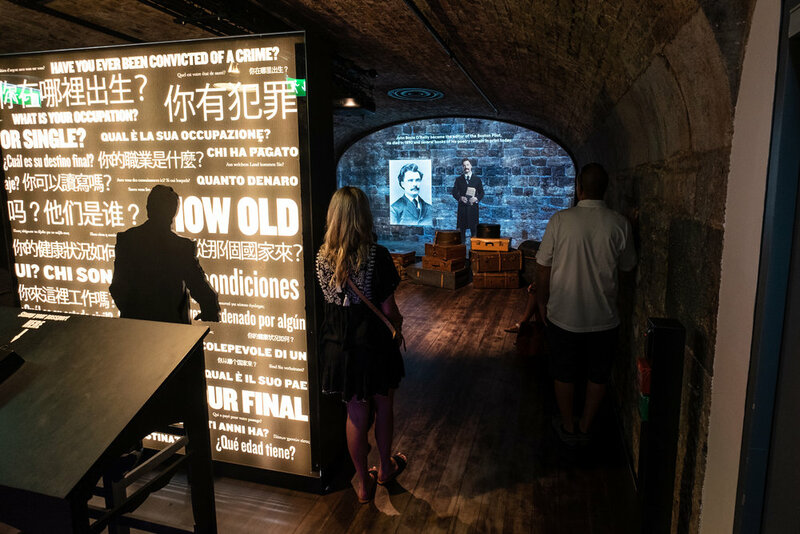 First stop was The Epic Museum, which chronicles the history of Irish emigrants who have left their homeland and gone on to impact countries all over the globe. We’re not always big “museum people", but we didn’t want the tour to end! It was fascinating, interactive, and beautifully displayed. Oh, and the best part? We had the whole place to ourselves. When you travel with Adventures By Disney, you’re basically traveling like a movie star (Or in Disney lingo - you travel with an everlasting Fast Pass). No standing in lines, no fighting crowds, no hassle. Ever. We were in and out before the museum even opened! Next stop was tea, coffee, and pastries galore at Bakehouse Dublin. ABD (Adventures By Disney) knows the way to our hearts. Next, it was time to walk off all of those said pastries on a walking tour around the city. We wore nifty little earpieces that made us feel like secret agents, and allowed for us to clearly hear our guide - even from hundreds of feet away! 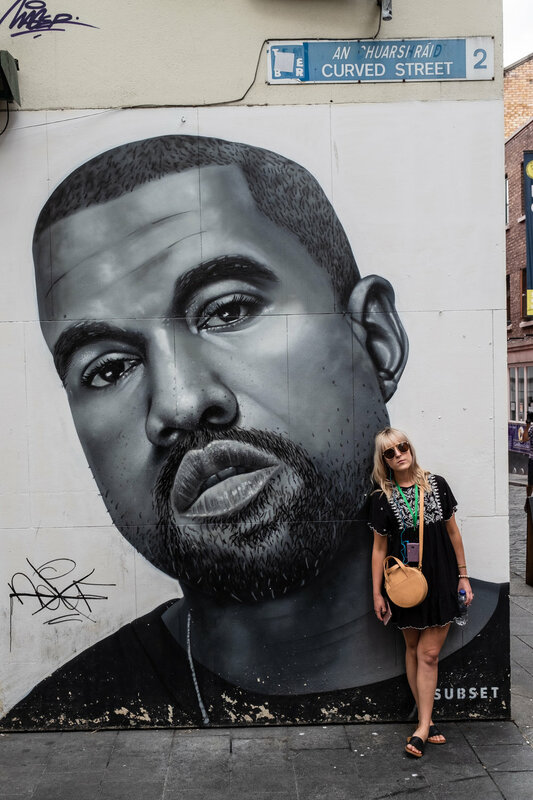 We saw government buildings, walked through farmers markets, explored Dublin Castle, walked by a Kanye mural (obviously), and kissed in front of the palace. Dreamy. 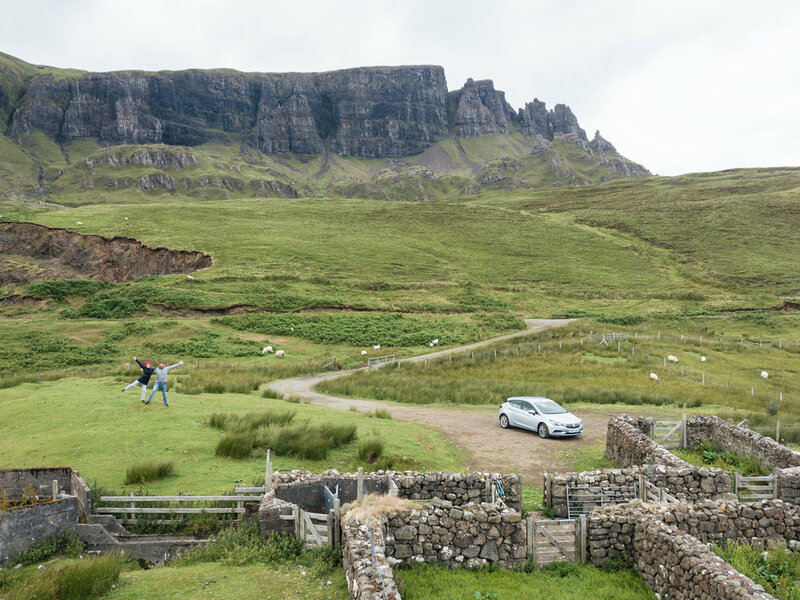 We ate fish and chips in a famous old pub, and then hopped into a roomy, air-conditioned bus to head to one of Bobby’s favorite places in Ireland. The Guinness Factory! That night was dinner on our own, and after a much-needed nap (partially because of jet lag, partially because of Guinness), we went off to explore the city. We found a cozy little Italian restaurant just a few blocks from our hotel (we know what you’re thinking - Italian food in Ireland?! We were craving pizza, ok! Sue us. ), and had a romantic carb-filled dinner. YOLO. Later that night we met with the adults in our group for a traditional Irish Pub Crawl. Filled with Guinness, music, dancing, Stephen’s quick-witted sarcasm, and Landon’s punny one-liners. Oh, and Murphy’s Ice Cream. 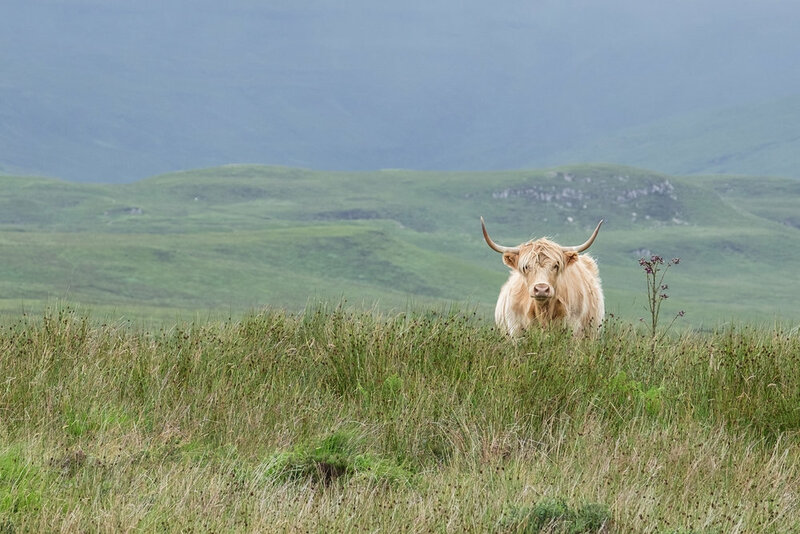 We’d go back to Ireland just for a scoop of that creamy, flavorful goodness. Time for our next destination! Landon and Stephen instructed us to have our luggage out of our room by 8am, so that they could have everything loaded up and in the bus. You’re probably thinking “Cool story”, or “That matters because…?” but just let that sink in. The ABD team does EVERYTHING for you. They handle your luggage. They give you water bottles and snacks. They educate you. They give you hand wipes. They even SING to you. It’s glorious. Well, maybe not Landon’s singing but that’s beside the point. It’s stress-free travel at its best. We hopped back onto our beautiful air-conditioned bus to start the trek to the quaint little town of Killarney. Prior to our destination, we had a hurling lesson, ate lunch in Kilkenny, and we toured the famous Rock of Cashel. We’re telling you, these days are crammed full of adventure! 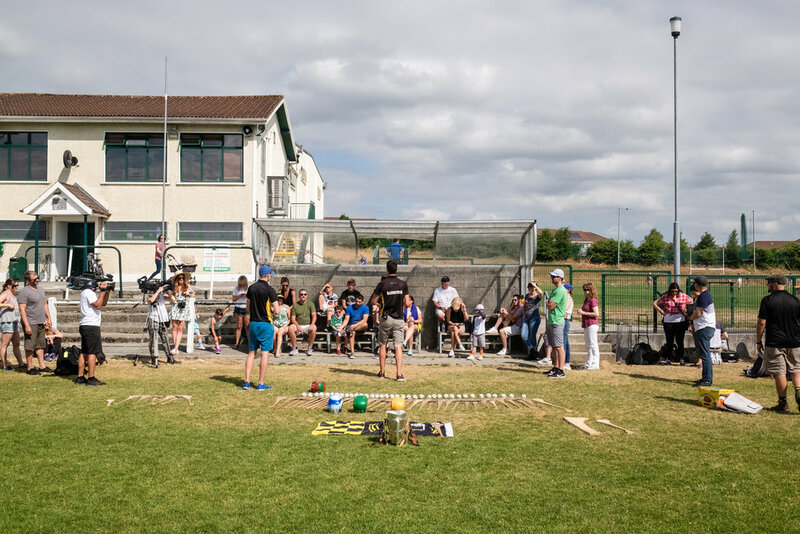 First things first, let’s talk about hurling. It’s way harder than it looks. Alli’s dream of being a professional hurler went out the window the second she picked up a hurley, but we had a blast learning the history of the sport and playing a good old fashioned hurling match. Even with Alli’s poor form and lack of skill, our team still managed to win. The Irish fairies were on our side! We celebrated our victory at a Irish sports pub in downtown Kilkenny, followed by celebratory Murphy’s ice cream (thanks Stephen & Landon, we’re hooked). We walked up and down the colorful streets, took photos along the water, and worked on our Irish accents. The accents improved daily (don't ask us to prove it). Next was a tour through the Rock of Cashel. The little ones in our crew went on a shamrock hunting adventure, and the “older folks” learned the history of this iconic place. The buildings date back to the 12th and 13th century, and it reputedly was the site of the conversion of Aenghus the King of Munster by St. Patrick in 5th century AD! Our “home” for the next few nights was the gorgeous Great Southern Killarney. Our ABD team had our luggage sent to our hotel, and hosted us for another beautiful dinner in one of the grand ballrooms of the hotel. Yet again, we felt like movie stars. It was exquisite. The mornings in Ireland were early, but we have never been more eager to get up! Every day the itinerary just kept getting better… and day four is no exception. After breakfast at the hotel, we headed off to the breathtaking Ross Castle on Lake Leane. There we split up onto a handful of fishing boats, where local Irish fisherman took us on a scenic boat ride down Lake Leane, the “Lake of Knowledge”. 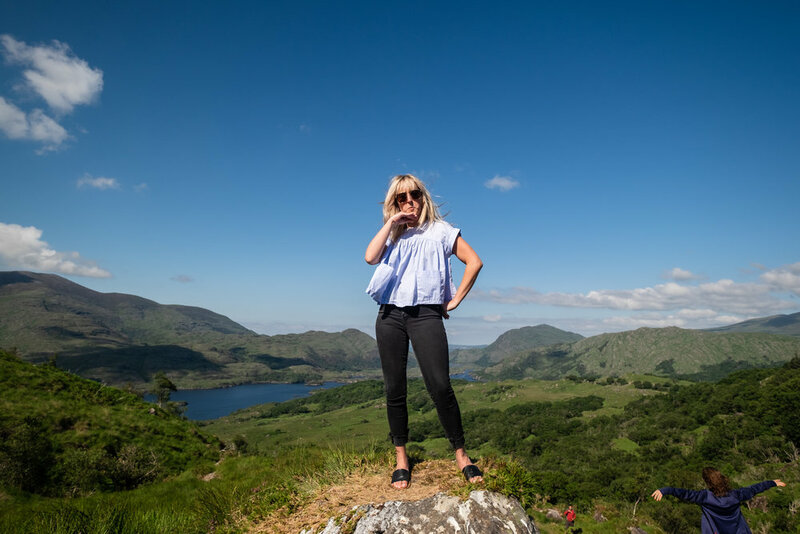 It’s the largest of the three lakes in Killarney, and is home to the famous monastery on Innisfallen Island, where our boat tour docked and let us to explore. There’s something so enchanting about seeing old ruins, running your hands across so much history. We could imagine monks walking through each room, praying alongside the water. It was beautiful. 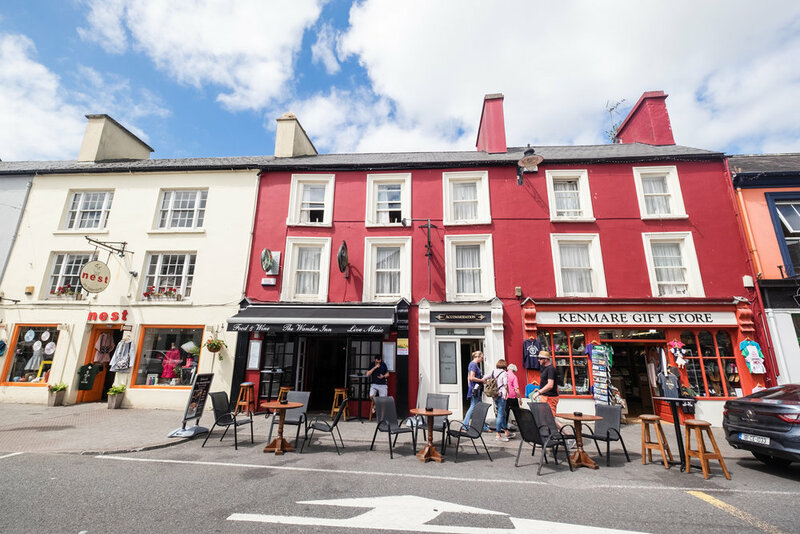 We took the boats back to shore and headed to the quaint town of Kenmare, where we explored on our own and grabbed lunch at our leisure. We found a restaurant with salads and avocados (we sure do miss avocados when we travel! ), and spent some time meandering around the cobblestone streets. The night ended with dinner on our own Killarney. We stumbled upon a cute little pub with live music, and spent the rest of our night snacking on french fries and singing along to Journey covers. Basically living our best lives. Chances are you’ve never heard of Foynes before. 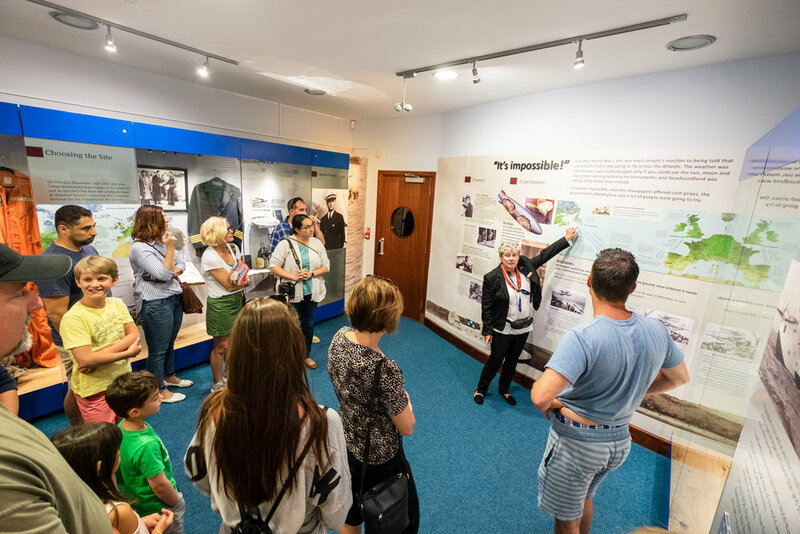 You’ve probably never heard of Foynes Museum either. Neither had we. 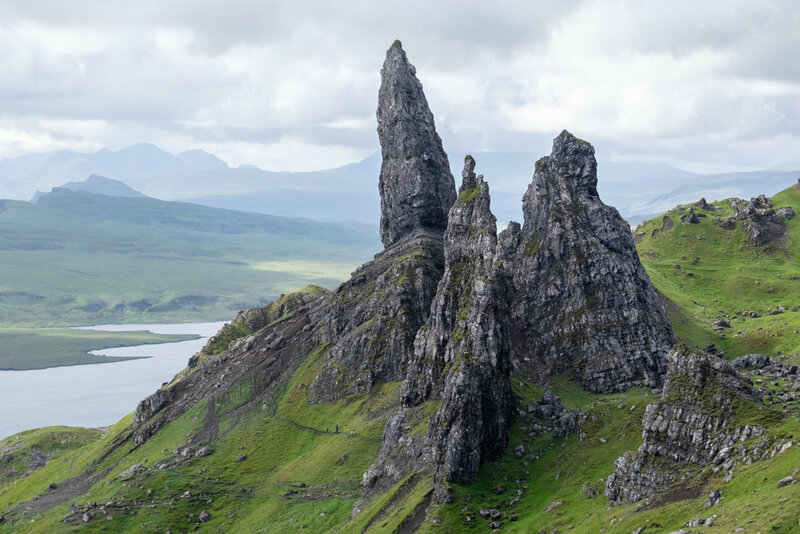 One of the many reasons we love Adventures By Disney is that they take you to places you never knew existed… and they blow you away. Day five began with a trip to Foynes, home of the Foynes Flying Boat and Maritime Museum, the only aviation museum in Ireland and the only “Flying Boat Museum” in the world. Flying boat? That’s ok, we’d never heard of one either! From 1937 to 1945, Foynes was the hub for these gigantic flying boats that would be flown across the Atlantic. They have a replica of one of the boats (or planes? ), and it is incredible! Especially for over 75 years ago! If that wasn’t enough, Foynes is also where the first Irish coffee was made! We learned how to make real, authentic Irish coffees (shoot us a DM for the secret recipe) and they were absolutely delicious! Now it’s time for our favorite part of the trip. The whole ABD team really hit it out of the park with this one… three nights and three days in a castle. Yep, a castle!! We arrived at the historic Dromoland Castle wide-eyed and jaws-dropped. It’s everything we could’ve dreamed and more! 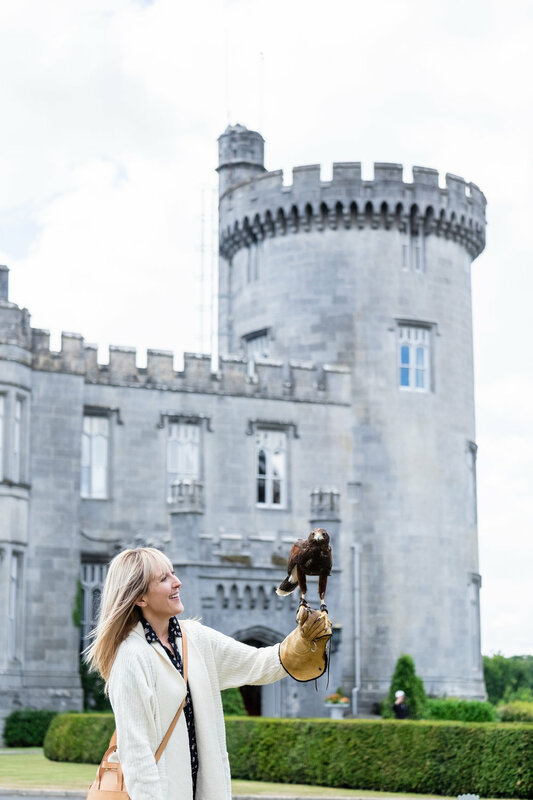 Built in the 15th century, Dromoland is not only dripping with history, but with luxury as well. The rooms are stunning, they treat you like royalty, and the amenities are endless. We’re still pinching ourselves that this place is real! Day five ended with an authentic Irish farm dinner, complete with cheese tasting. scone making, sheepherding,and a traditional Irish sing-along. Is that the dream or WHAT? Alli kept repeatedly thanking Stephen and Landon for taking us there - it was something out of a movie! We honestly can’t put into words how incredible the night was. So, we’ll let these photos do the talking. It was an evening we’ll never, ever forget. Mesmerized by the sheer vastness of the property, we then embarked on a walking tour around Dromoland Castle. Our quirky and charming guide taught us the history of Dromoland, showed us around the grounds, and entertained us with his quick Irish wit. And this was all before noon! The rest of the day was spent at our leisure. 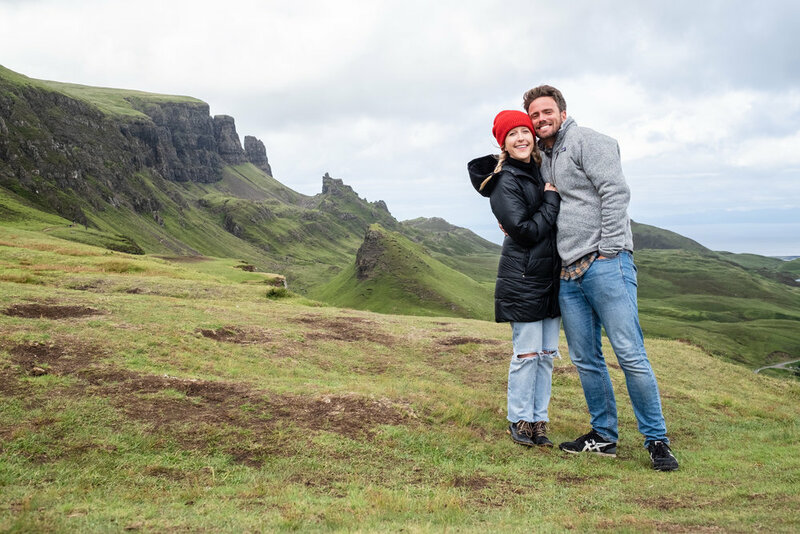 The ABD team gave us a plethora of entertainment options… We could go golfing, partake in archery, go on a “Hawk Walk”, go fishing, indulge in a spa treatment, and so much more. Being the over-achievers that we are, we tried to cram in as MANY activities as possible. And we did a darn good job. And together we went on a hawk walk, where we got an advanced lesson in falconry and learned how to train a falcon. We definitely scored a few cool points for that! The ABD team even put together a special slideshow with photos from our trip so far. Reflecting on how much we’d done in 6 short days was unbelievable. It truly was the trip of a lifetime. And we still had one more day! DAY SEVEN: CAN WE PLEASE EXTEND THE TRIP? Day seven. The day we’d been dreading because it meant our ABD adventures in Ireland were about to come to a close. Even now it brings tears to our eyes. But nonetheless, we went out with a bang. 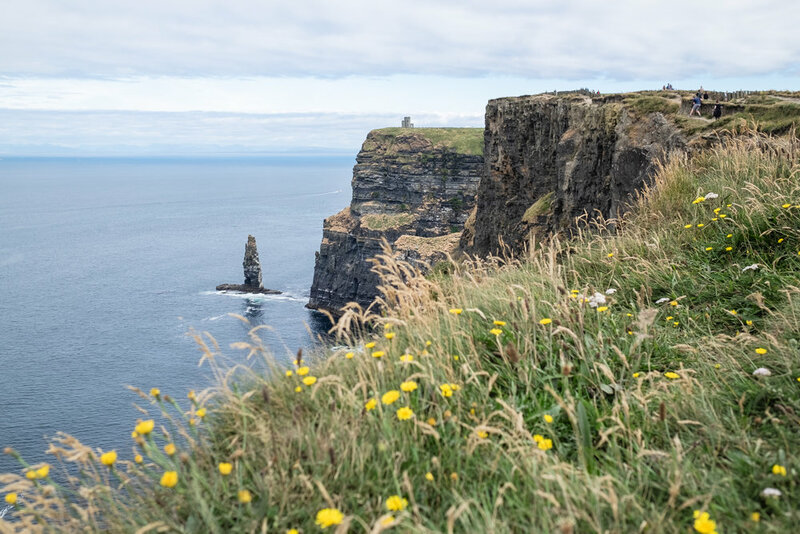 Our ABD family ventured to a spot that’s been on our bucket list for years: The Cliffs of Moher. Standing 700 feet above the sea, it’s one of those places that instantly takes your breath away. Even though we didn’t want to leave the Cliffs of Moher (we’ll be back! ), it was time for lunch. The ABD team brought us to a traditional Irish pub in the small town of Droolin, that’s been run by the same family since 1867. 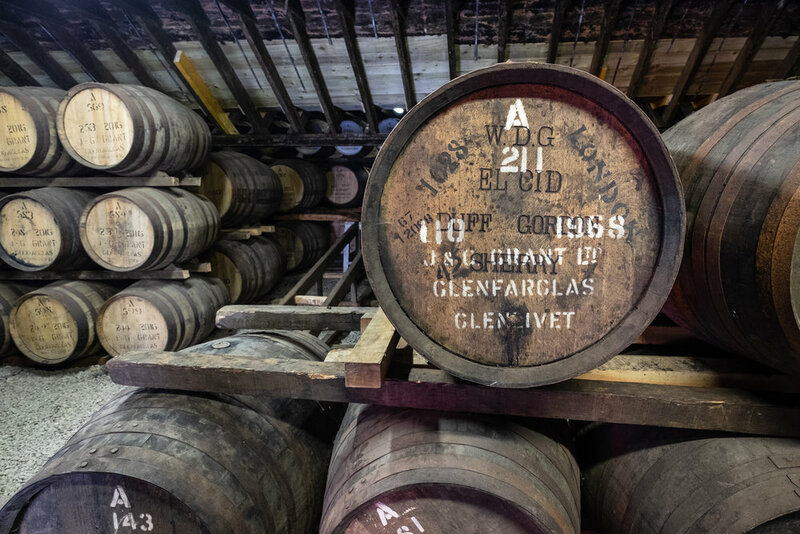 How they find such hidden gems we’ll never know! We ended the afternoon with a tour through Ailwee Cave - one of the oldest caves in Ireland. Our private guides taught us about the history of the caves and how they formed. They even turned off all the lights inside and has us stand there in pure, black darkness. It was terrifying and totally awesome. And just like that, we reached our final dinner with our ABD family. As amazing as our itinerary, lodging, meals, and experiences were… the people we met during this week-long adventure were the real highlight of the trip. There’s something so bonding about experiencing new cultures with a group of strangers. Even though we’d only spent a week with these people, they already felt like family! We hugged, cried, exchanged information, and cheers-ed to the trip of a lifetime. It really was just that.